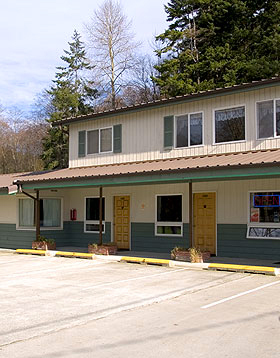 Lake Campbell Lodging is situated in the heart of beautiful Fidalgo Island just four miles from Deception Pass and five miles from historic Anacortes, gateway to the San Juan Islands. With neighboring areas like Whidbey Island and beautiful La Conner with all its shops, we are centrally located to many destinations. It’s a great place to stay for your short day trips to the islands. Walk onto the ferry in the morning and return on the late ferry home. We have been family owned and operated since 1968 and take great pride in offering our guests a clean and comfortable place to come and relax. Family reunions and wedding parties are welcome and some have been returning to us every year for more than fifteen years. Lake Campbell Lodging has built a foundation in our return customer base and we believe it is due to the way we take care of each and every individual and there needs. We encourage guests that have never stayed with us to come and take a look and before you know it you too will be visiting every year because after all, when you stay at Lake Campbell Lodging you are not only a guest, you become part of our family!